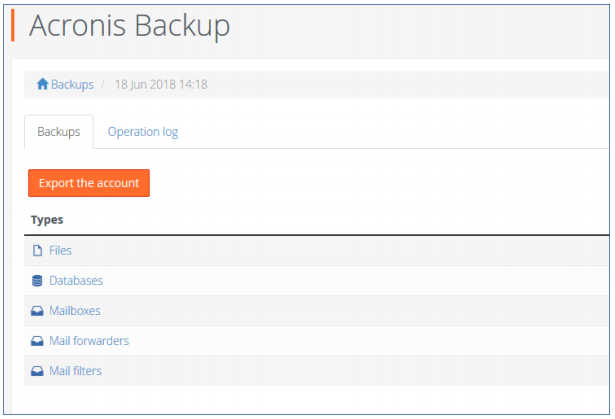 If your cPanel accounts with the enabled Acronis Backup privilege can browse backups in their cPanel interface and download or recover files, folders, databases, mailboxes, mail filters, mail forwarders, and entire account. After you select the recovery point, the corresponding backup is mounted to the cPanel server. The process may take up to a few minutes. Select the files and folders to download. If you choose to download a single file, the download will start immediately. If you request to download several files, a .zip archive will be prepared and placed into your home folder. Once the archive is ready, download it by using the link in the notification bar or in the Operation Log, or by using the File Manager. After you select the recovery point, the corresponding backup is mounted to the cPanel server.The process may take up to a few minutes. Select the files and folders to recover. If at least one folder is selected, you can select the Delete any files in the original location that were created after the backup option. If this option is enabled, all files from selected folders will be deleted before the recovery.This option may be useful if your website were hacked, to ensure that all malicious files are deleted. As a result, the selected files on the cPanel server are replaced with their copies from the backup. Select the databases to download. As result, a .zip archive with SQL dumps is prepared and placed into your home folder. Make sure that the Add suffix to the recovered database name check box is cleared. As a result, the selected databases are recovered to the original location. The existing databases are overwritten. If a database no longer exists, it is recreated automatically. Select the Add suffix to the recovered database name check box. existing databases are not affected. Select the mailboxes to download. Select the mailboxes to recover. longer exists on the server, it is recreated automatically. Select the mail filters to download. Select the mail filters to recover. Select the mail forwarders to download. Select the mail forwarders to recover. [Optional] Select Skip export of databases and Skip export of home directory check boxes. Check the results in the Operation log tab. If the account was exported successfully, you can download the archive.